The Hinterlands is divided into four sections: “Lightwood” poems introduce a vision of romance and the lost romantic period in contemporary culture. “The Pomegranate” poems revolve around Persephone, women, girls, issues spawned by maltreatment, the element of Hades as hell on earth for women, gender issues, and daughterhood. “Sleeping Dogs” shows the “dog” in man through his stubborn doggedness of dark and sometimes evil actions. “Shadowed Limbs” addresses exile through expatriated characters, victims, witnesses of violence and displacement, and the earth as a fallen place. The sawmill is a part of the speaker’s psyche—the workers, their wives, the machinery, trucks, donkey cart, and the logs being winched from the mud of the timeless and ever-flowing Berbice River. 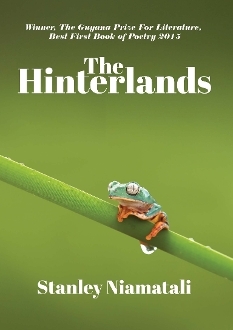 A hundred miles up the Berbice River, Stanley Niamatali gives a glimpse of the forest where the mighty greenheart and purpleheart are felled by indifferent loggers who wreak havoc on the forest and its dwellers to fulfill their tenders. At the same time, the poet walks the line between two cultures, impossible to extricate himself from the past and unable to integrate himself into the present, forever seeing the same callous disregard for decency, compassion, and dignity.